This was outside court today. Disgraced, former PM, Najib Abdul Razak leaves the court complex. He does NOT look happy. 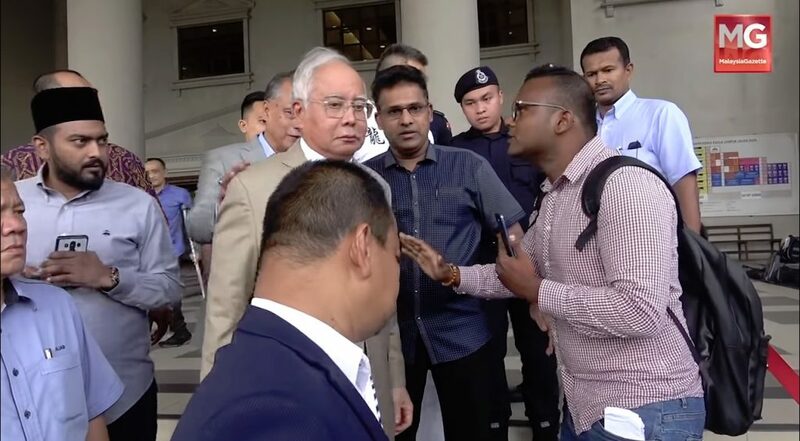 A man claiming to be a law student rushes towards Najib. He demands to know why he is prevented from attending the hearing! Najib is the wrong person to ask. The policeman stops the student from approaching Najib and orders him to step aside, while trying to pull him away by his sleeves. The student ignores him and and holds Najib by his hand, whilst quizzing him. Najib reprimands the cop and tells him that the student just wants to ask a question. The pressure is mounting. It shows on Najib’s face. Najib should understand that the policeman was only doing his duty. Fortunately it was just questions that the student had directed towards Najib. What if the man had a knife, and not questions to hurl at Najib? Later, Najib realises he is being videoed and apologises to the policeman. He enters his car and leaves. What happened to the Black Maria? Maybe not today eh? Reporters interviewed the student but he refuses to give his name. After all that commotion, he fizzles away! He was frustrated that he had been waiting since morning to enter the court room. He said that were too many procedures, rules and regulations to enter the court room. He claimed that Najib had said that this was a public hearing. Maybe so, but Najib is not the PM nor is he in power anymore. 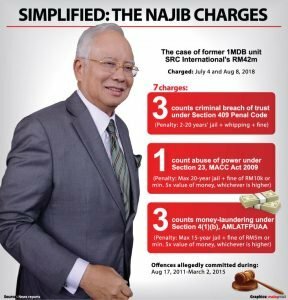 Moreover, the court procedure is NOT in Najib’s control. Did he say he was a law student? This is just Day 4. The less said of the whole saga, the better. I rest my case.